Emare contains 28 stunning 4 or 5 bedrooms villa-apartments with surfaces between 407 m² and 840 m² at the Estepona frontline beach makes this project unique! A home where a new luxury lifestyle with open space innovative design embraces the latest technology and quality finishing materials. Do you fancy the benefits of a luxury private villa or penthouse and the security of a closed community with a unique frontline beach location? The Emare project on The New Golden Mile is your chance to buy and achieve your dream house! Discover which apartments are still available and download the floor plans on the property page of this project. Emare homes need the highest quality if it comes to your furniture, indoor and outdoor. We can advise you from our wide range collection. 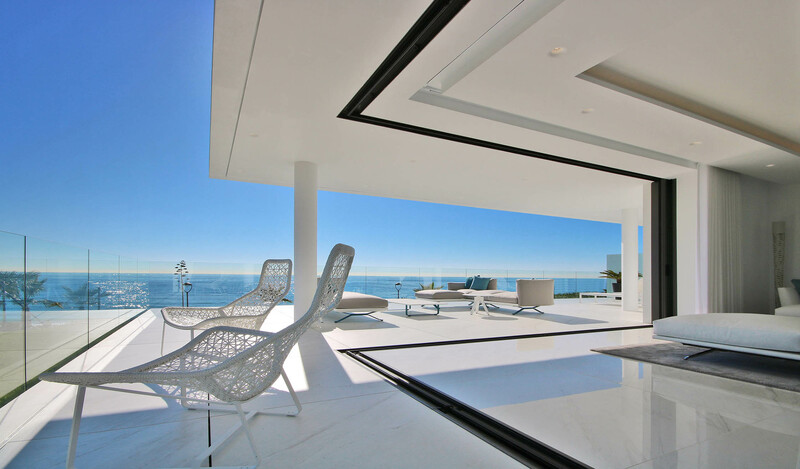 We offer you the best possible design for the interior and exterior of each apartment, penthouse or villa. Only the best is good enough! Comfort is key for your home in Spain. Discover our website. Do you want to know more about the location of the Emare project? Take a look to the location page.